Catamount Maple Wheat is a full-bodied, smooth wheat ale made with genuine Vermont maple syrup. The original version of this beer was brewed in the winter of 2009 by Harpoon Vermont sales representative John Baker. Harpoon brewer Brett Simmons based his 2011 version on John's recipe, with some tweaks to make it his own. It is brewed with a combination of wheat malt, pale malt, caramel malt, and mildly hopped with Willamette. The balance of malts and hops allows the distinct flavor and aroma of real Vermont maple syrup to take the lead. The pure Vermont maple syrup used in the beer came from Baker Farm in East Dummerston - the family farm of John Baker - and Scrag Mountain Sugar House in Waitsfield. The maple sweetness and body that blankets this velvety amber beer showcases one of New England's most beloved traditions. 22oz brown bomber with a best by freshness date on the bottle. Clear brass colored brew, impressive head stacks high with a decent retention as well. Hint of maple, faint butter, toasted grain and an even more faint grassiness in the nose. Big on smoothness with a creamy medium body. Maple flavor goes up against the buttery tone of the yeast and maltiness to make for a pretty sweet beer. Modest hopping alcohol warming alcohol don't do much to balance. Some apple and pear fruitiness in the back, sweet lingers for a while. A half decent beer to pair with sweets and definitely to share as one bomber if too much to be had. Pours a three finger cream head that fades quickly to a thin layer leaving some lace. Crystal clear amber color. Good carbonation and medium bodied. Hint of a maple nose. Flavor maple syrup is up front, no cloying, minimal wheat, slightly better than 100 barrel series #26. $5.99 for a 22oz bottle from Market Basket Concord, NH. New shiny neck label for their 100 barrel series this is the first one I've seen around in my area for awhile. I got excited when I saw this and Long Trail coffee stout side by side for reasonable prices. This one a clear amber body with a fine off white tan cream head with fine speckled lacing. Aroma has light pale wheat with hints of caramel, and an air of fresh maple syrup...look this is a smell taste texture I'm all too familiar with. Real maple syrupy takes like 52 gallons of sap to boil down to one gallon of syrup. I used to work with a retired doctor in Northern West Virginia where I collected sap everyday after school. This stuff we boil down at his sugar shack and would package up in mason jars was simply amazing, it would go well over ice cream, pancakes, waffles, or any untraditional use of maple syrup you can find. This flavor hits me with a touch of true maple syrup amongst the the pale wheat malts used but nothing comes close to the actual maple syrup flavor I'm familiar with. Mouthfeel is medium to light bodied heaviliy cabonated nothing cloying just I wish there were true hints of maple syrup. Overall drinkability was solid something I couldn't picture myself drinking on a regular basis but it was a decent big beer for Harpoon's 100 barrel series. This one was on one of the rotating taps at the Ginger Man in Austin. As with most regular beers at this bar, the beer is served in standard pint glass. The beer is dark copper with an off-white head. It had decent lacing. It has a very faint nose some fresh malt and something floral. The taste is grainy, slightly sweet with a bit of bite at the finish. Slight maple at mid-glass, but it needs to be turned up a notch. The mouth is medium thick with a touch of slickness. It is not bad, just not as advertised. 22oz bottle purchased as a single at Yankee Spirits, Sturbridge, MA. Poured into an imperial pint glass, formed a 1/2" beige head over the crystal clear burnished copper brew. Head Recedes gradually, with lasting sticky lace. Aroma is sweet, lightly spiced. Taste begins malty, then shows some spiced banana/clove character in the middle, and closes lightly bitter. Mouthfeel is soft and smooth, and drinkability is pretty good. Name indicates maybe the maple should be a bit more upfront, but a pretty good brew. bought a 22oz bomber (aren't they all? ), poured into a Sam Adams "Perfect Pint" glass. A: 3 fingers of off-white head. reddish-amber color... clear... beautiful-looking beer. really well-put-together -- just wish the taste matched the looks. S: sweet, faint hops. subtle malt... otherwise not much. T: rich, but not overwhelming malt. nicely balanced. wheat characteristics subtle (almost too subtle), don't dominate. expected a more "wheaty" flavor based on the name. finish is crisp with only a *faint* maple taste, and even then, not on all sips. M: moderate carbonation. smooth, medium body. D: very drinkable, but just tastes like a nice amber. not worth the $$. overall: i know that many maple beers overdo it, and taste like you're drinking a pancake, but this beer could have used a little more maple presence. The head on this new brew is almost non-existent. It dissipates far too quickly with tiny little bubbles dancing on the top. The color is that of a late fall sunset in Vermont. Picture perfect amber hue with hints of orange throughout. For a "Maple Wheat" as it is called; I found it to be lacking slightly in both parts. The words "real Vermont maple syrup" are listed on the label and I thought I'd be getting a big old taste like having flapjacks at the ski lodge. Not the case. It does have some Maple flavor in it, don't get me wrong. Also it seems to be quite hoppy for a wheat beer. Not that I mind, it was just unexpected. All in all, a very refreshing beer. i had this on tap at the Local Pub in Saratoga Springs NY. I was happy to see it, as I've come close to buying a bottle a couple times but always shied off. It's a medium orange shade, not very dark, good clarity, with a very thin ring of foam. I could definitely get the maple in the aroma, plenty of esters and some phenols too. Above all it didn't smell aggresive, just approachable. You can taste the maple but it isn't very strong, more of a complementary flavor to what is otherwise a sort of unremarkable wheat ale. Somewhat sweet upfront, with esters and maple leading the way, with a little bitterness in the middle and a clean aftertaste in the end. As an apertif it served well, not what I chose with the meal though. On-tap 2/22/2011 at Track 84 in Warwick, RI, served in a Harpoon 100 BBL Series large tulip glass. A: The beer is a light brown color, with a large off-white head that fades slowly and leaves a thick lace on the glass. S: The aroma contains caramelized malts, wheat, maple, some fruit and a touch of hops. T: The taste starts out bready with flavors of wheat and a hearty malt character. Then some mildly sweet flavors of caramel, maple and some fruit come in. The hops presence is mild and complementary bringing a little bit of balance. D: A little tasty, goes down easily, not too filling, decent kick, good representation of style while adding a slightly odd but well-done twist, solid beer to drink for the style if you're looking for a something just a bit different in a wheat beer. Harpoon is one of the breweries that makes very interested "special series" beers. Where I think many go with extreme beers, high in alcohol, hops or everything, Harpoon chooses some very interesting styes that are unique but not crazy. This is another good example of that. I wasn't crazy about the beer myself but i've seen it to be very popular and enjoyed by people with very limited tastes in beer. Color was darker than a pale wheat would be, maybe more of a pale ale color. Carbonation was good but, again, not as a wheat might be. Aroma had some citrus, a lot of wheat esthers and a very present maple. It was what really set this beer aprart. Flavor was quite good with an excellent balance of the wheat, yeast and just enough maple to make it interesting. Everyone should try this beer at least once. A: The beer is clear dark yellowish amber in color and has a light amount of visible carbonation. It poured with a finger high beige head that died down and left a thick ring of bubbles on the surface around the edge of the glass. S: The smell isn’t very strong and has aromas of sweet maple syrup and wheat. T: The overall taste has notes of maple syrup in the flavors, which are slightly stronger compared to those in the smell, but still not very prominent. The maple syrup is most noticeable in the finish and contributes some hints of sweetness. M: It feels light- to medium-bodied on the palate and has a moderate amount of carbonation. The finish is somewhat sticky. O: The beer is an interesting take on the style due to the subtle hints of maple syrup in the aromas and flavors. Pours a copper color with a two-finger head into my glass. Nice presentation for the style. A good dollop of maple greets the nose. It's somewhat sweet like maple candy though. I'm intrigued. Lots of maple notes to greet the palate. Subtle with a good hint of clove in addition. Mouthfeel is chock full of lingering maple and clove flavors. I didn't expect much less. I can't really think of a better way to describe this beer. It's a maple wheat ale and while it's not flashy, it has it's own merits. Check it out. A: Clean, clear copper amber color with a thin, creamy head of white foam which left a bit of sticky lace. Carbonation looks good and clarity is nice. S: Toasted grains and a bit of maple butter aroma. Hops seem light and floral at best. T: Sweet caramel malt flavor up front with some buttery, maple syrup flavors in the mix. Dextrose is a bit much, but it's balanced somewhat by dry wheat malts that lend a bit of fruitiness. Finishes relatively clean with a little residual sweetness and little in the hops department. M: Medium bodied ale with some sticky sweetness from the grain and maple used. Fairly clean overall though. D: It's a sweet brew, so the near 7% ABV doesn't surprise me. It's a tough beer to pair unless you're having some pralines or a maple cookie or something. Could make for a decent apertif but I'm not going back for more anytime soon. A: Poured from a bottle to a weizen glass. Had a medium brown color and a completely clear consistency. There was an inch of foamy, fairly long-lasting head. No lacing at all. S: There was a sharp aroma of wheat, malt, and some sugar. T: Tasted of malt (more than anything else, wheat, and a sugary quality. Not the most dynamic flavor, but serviceable. Actually gets better as it goes along. M: A good amount of carbonation with a smooth, sharp finish. Medium-bodied. D: This is a mixed bag of a beer, but that's to be expected of a style that's not terribly interesting. Still, a basically drinkable beer. A: Pours a dark orange/copper with a finger of light tan head that quickly recedes into almost nothing with very little lacing. S: Bubblegum, bananas, and hearty bread with maybe a touch of maple. T: Similar to the aroma, there is some banana/bugglegum up front. Then comes a thick, bitter bread flavor with a little bit of maple. The finish is clean and bready. M: Medium-light body with medium carbonation, this beer goes down pretty smoothly without too much sweet or bitterness. Overall, not a bad beer, but not good either. The maple is hardly there and the flavor is a bit bland. A: Pours a deep bright amber color with a thick 2 finger foam head that has excellent retention. There is lots of lacing all down the sides. S: Ample amounts of sweet maple syrup, wheat, earthy hops and caramel. T: Starts off with an extreme amount of maple syrup taste up front. In the middle, there is just a slight undertone of earthy hops. On the back end lots more sweet maple, burnt caramel and toast. M: Leaves a thick slick taste on the palate. A medium bodied beer. O: The maple syrup is there for sure, but not sure this is a pale wheat ale. Thought there would be a little more balance to this, maybe a little hop and yeast tastes. Bought a bomber at White Horse in Absecon, NJ for a great price ($4.50). Poured into a 22oz Munchen Mug. Appearance dark amber/copper color with creamy head that dissipated quickly, no lacing. Smells malty with a whiff of maple in there. The maple syrup is lost in the taste however, which I was hoping would be a little more pronounced (the idea of vermont maple syrup got me to purchase the beer after all), it is quite bready with a lingering hint of hops on the tongue. I don't find it too sticky, and it is surprisingly crisp and clean for a wheat beer. All in all the beer is somewhere between average and good, not outstanding, very drinkable though; would enjoy this in a sixer or something as a get-home-from-work kind of beer. For the price of the bomber though, I don't regret the purchase, and I would like to try more from this series. Poured into a Masskrug mug. A..Very nice looking beer. Deep mahogany color with a red hue. Really happy with the look of this beer. S..Sweet, which should be expected since it is maple wheat. However, I was a little hesitant as it smelled a bit too much like perfume. T..Not what I had hoped for. Something about the way the maple flavor was presented made me think I was drinking some sort of beauty product my wife might use. It is difficult for me to describe the flavor(s) since I had to work at drinking 3/4 of the bottle. O..As nice looking as this beer is, drinks are not about how they look but how they taste. And unfortunately I do not like the taste of this wheat ale. One of a few times I have not finished a beer. Disappointed as I had high hopes for this Harpoon offering. From batch #35. Sampled on March 27, 2011. The pour is a nice looking amber-copper with great clarity. The aroma is a pleasant array of sweet malts and maple syrup but more subtle on the wheat. The taste is also on the sweet malty side with a thin layer of wheat on the edges and an adequate bitter hopped ending. Not a bad brew. 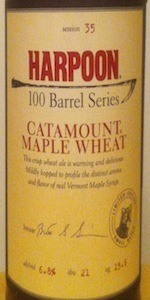 According to the Harpoon's website this is based off the last Catamount Maple 100 Barrel but was tweaked a bit. Clear, dark amber with a 1" white cap. Good retention and lace. Harpoon always has great clarity in their beers. Maple comes across as a lightly smoky wood character in the aroma. Taste-wise a more obvious but not overwhelming maple. Bright and fruity bubble gum sweetness doesn't mesh well with a 6.8% malty sweetness. Not one of my 100 Barrel favorites. Kicker is that Harpoon put it out twice.